I am a coffee lover. You’ll know this if you’ve read my previous coffee review on this site. Coffee to me is more than just a stimulant to help me out of bed in the morning. It’s a pleasure in and of itself. A good mug of coffee or a shot of deep dark espresso should be savoured as one of life’s little pleasures; whether first thing in the morning, during the working day or even last thing at night, I enjoy a good coffee. 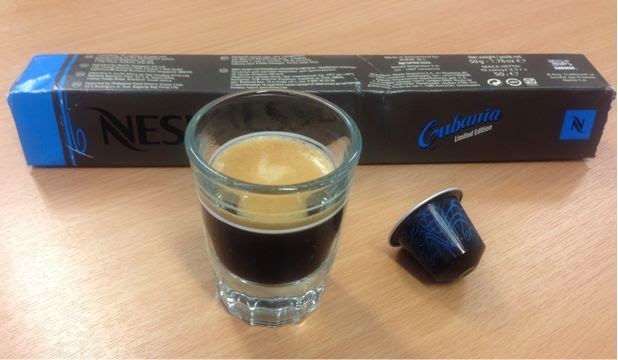 Today I’m reviewing their latest limited edition Grand Cru capsule, the Cubania. This coffee is said to be “inspired by the passion and the warmth of the Cuban way of life”! That sounds like quite a challenge to squeeze into a hot drink. By the way, surprisingly these capsules contain no Cuban coffee. When you think of Cuba you picture sun, sea, beaches, beautiful women, alcohol, cigars, classic American cars and Gloria Estefan. Actually I often picture Gloria Estefan, but this is not the place to discuss that. I inserted the capsule into my Nespresso machine, switched it on and patiently thought of Gloria. The espresso shot delivered looks the part, the right consistency, good texture, not watery. The crema was just a couple of millimetres thick, not as deep as their Ristretto capsule produces, but more than adequate. The Nespresso website describes the aroma as powerful and complex. I will have to disagree here, I found it quite underwhelming, far more muted than their other capsules. But what it lacks in initial aroma it makes up for in spades with the flavour. Simply wow. The strength guide gives it a 13 out of, well what used to be just, 10. This is their strongest coffee yet. The coffee warmed, I would even say tingled, the sides of my tongue and the flavour lingered delightfully for ages after each sip. They have in my opinion developed exactly what an espresso should be! Rich, strong, full of flavour, a long lasting experience, with no bitter tones, in many ways just like Gloria.